We supported an event held by Gwent Police and Police in Newport. 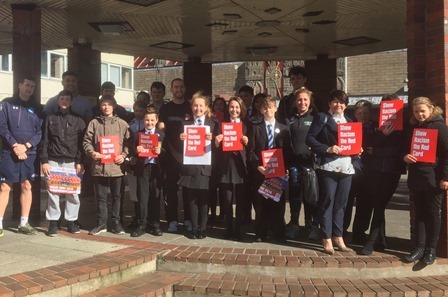 Gwent Police recently held an event in Cwmbran supported by the Police and Crime Commissioner Jeff Cuthbert which was aimed at promoting Hate Crime Awareness and ways of reporting Hate Crime to the police. As part of the community event SRtRC were invited to deliver a unique workshop outside with a group of young people from across Gwent. Campaign Worker Jason Webber delivered a sample of our educational activities exploring the topic of racism and hate crime. There were lots of discussions of the importance of breaking down stereotypes and challenging negative attitudes particularly towards protected groups in society. The workshop was well received by the young people who had many questions regarding current topical issues in society. Each of the young people received SRtRC Wales football team posters and information about reporting a hate crime. We would like to thank Gwent Police for inviting us to their event and will continue to work in partnership in the near future.